Adult Description: The African Cluster Bug (Agonoscelis puberula) is 8-10mm long with a yellow body that may have a red tint to the wings. On the dorsal side of the abdomen there are black marks that look like punctures arranged in stripes. There are distinct coarse black hairs or spines on the abdomen as well. A scent gland is located at the end of the abdomen. Larva Description: Eggs of A. puberula are typically laid in the full resulting in nymphs that are brown in color with similar markings to that of the adult with dark stripes on the dorsal side instead of puncture like dots found on the forewing of the adult. Host Plant: Thyme, flax, coffee tree, and the invasive weed horehound. Ecological Threat: Agonoscelis puberula is a threat to farmers' crops of thyme, flax, and coffee tree. It has been known to significantly effect winter fruit yields in Africa and remains a possible threat in the Southern United States. Biology: Agonoscelis puberula are usually found in large groups and are rarely found individually or in pairs. It is an important indication if one has been located because there are likely hundreds more nearby. 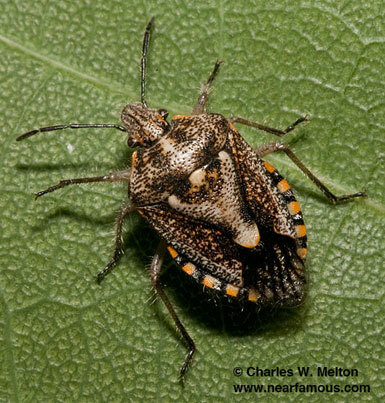 An individual seed of horehound may contain a cluster of 30 adult African Cluster Bugs. History: Agonoscelis puberula is native to Africa and is believed to have been introduced into Mexico as early as 1985, but was not discovered in the United States until 1990. U.S. Habitat: Agonoscelis puberula prefers hot climates that have little fluctuation in temperature. The variety of host plants can range from invasive weeds on the side of the road to fields of thyme or flax. Agonoscelis puberula is often mistaken for Prionosoma podopioides. However, it is argued that the Agonoscelis genus has overlapping species with the genus Trichopela. They are anatomically similar but phenotypically they vary in markings on the forewing membrane. The genus Agonoscelis has dark black stripes on the forewing membrane while genus Trichopela has no markings in that area. D.B. Thomas. (2003) The African Cluster Bug, Agonoscelis puberula (Heteroptera: Pentatomidae), established in the New World, Florida Entomologist 86(2): 151-153. Distant, W. L. 1921. The Heteroptera of Indo-China, Family Pentatomidae. The Entomologist 54: 3-6. Gross, G. 1976. Plant-feeding and other bugs (Hemiptera) of South Australia. Heteroptera—Part I. A.B. James, South Australia. Haines, G. C. 1935. Cluster Bugs. Farming South Africa 10(109): 182, 188. Hsiao, T., S. Ren, L. Zheng, H. Jing, H. Zou, AND S. Jensen-Haarup, A. C. 1920. Hemipterological Notes and descriptions I. Entomol. Medd. 13: 209-224.